In partnership with Swim England we are launching the latest phase of the #LoveSwimming campaign focusing on the positive impact of swimming for your physical health and for managing a range of health conditions. #LoveSwimming is the first ever industry-wide campaign that is getting the UK talking about swimming. Working in collaboration with Swim England we are able to reach a wide audience to shout about the many benefits of getting into the water and enjoying a swim. Whether that be for fitness, with your kids, on holiday or taking the first step in learning to swim or improving your swimming. This campaign highlights a number of real-world stories, from people who have experienced the many benefits that swimming has to offer. We help adults as well as children to learn to swim. You may not be 100% confident in the water or you need some support to get back into the water, we have highly skilled and trained staff on hand to get you started who follow the Swim England and Swim Wales pathways. We'd like to encourage as many people as possible to come swimming. You already know the benefits of swimming but we'd like you to bring a friend, colleague or family member with you on your next visit so they can experience the delights of swimming. Register below and download your 2 for 1 voucher that you can print at home and present at your chosen participating pool. Which Freedom Leisure swimming pool do you mostly use? Voucher is available to use at participating 25 or 50 metre pools only, on redemption of the 2 for 1 voucher. Valid for 2 adults (aged 16 and over) with one full paying adult swimmer. Subject to availability/capacity and some exclusive or structured sessions may not apply. Valid for one use between 2 April until 24 May 2019, Monday – Friday only during public swim times. Please check pool opening times for details or contact your local participating pool before you visit. Discounted prices will vary according to your chosen pool. Any additional adult tickets purchased at the same time will be charged at the full prevailing rates. Evidence shows that one in four patients would be more active if their health professional advised it, yet nearly three quarters of GPs do not speak about the benefits of physical activity to patients due to either lack of knowledge, skills or confidence*. The current Health Secretary, Matt Hancock MP, has called for a “culture shift” and for medical professionals to act on the evidence that activity, such as swimming or long walks, can cut the risk of illness and boost survival from major diseases. To showcase the physical benefits and the impact of prescribing swimming, we'd like to share the stories of individuals who have experienced phenomenal physical health benefits as a result of being prescribed swimming. After suffering a serious back injury (as well as on-going asthma and arthritis issues), Wanda was told she would need to use a walking stick permanently. 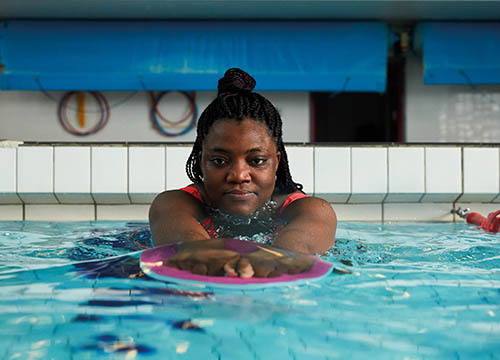 Thanks to the advice of her physiotherapist, she started swimming and says it has completely changed her life. When she starts swimming, she leaves the aches and pains on the side of the pool with her water bottle and it also has worked wonders for her arthritis.She’s now a wonderful advocate for swimming and is an ambassador for Swimathon.